In terms of power, it’s hard to argue with the company’s current standing in the pharmaceutical world. With more than twenty thousand employees around the globe and $20.8 billion in revenue in 2017, Bristol-Myers Squibb is one of the largest players in its industry. That’s in no small part thanks to the diverse workforce that the company has cultivated, Leung says, and maintaining it is an ongoing effort that takes place at the company’s locations around the world. The company pursues initiatives such as the development of People and Business Resource Groups (PBRGs)—including the Black Organization for Leadership Development (BOLD) and the Bristol-Myers Squibb Network of Women (BNOW), just to name a couple—to increase diversity in the workplace and support business objectives, career advancement, and the developmental needs of employees. Within the eight PBRGs, employees voluntarily work together on a single dimension of diversity to help drive business results, and members network, learn skills, participate in learning-development events, and contribute to the company’s various business objectives. It’s not always part-time work, either; Leung points out that leadership has taken high-performing employees out of their day jobs so that they can work full-time for at least a couple of years for BOLD and BNOW, and it’s looking to do the same for the other PBRGs. This is why, in addition to its myriad PBRGs, Bristol-Myers Squibb has supported an Inclusion Internship Program for law students for nearly two decades. The program provides career-development opportunities to law students by providing them with client- and customer-focused assignments that they get to carry out under the supervision of members of Bristol-Myers Squibb’s legal staff. Although the company’s website says summer internships are not expected to lead to an offer of full-time employment, Leung says it’s not out of the question either. “We expose our outside law firms to these interns, and a number of them have been hired right out of law school,” she says. Her outside partners themselves appreciate the arrangement, too. “It is a privilege to work with Sandra Leung, who shares our foundational belief in the power of diversity and inclusion in the modern-day workplace,” says Mitch Lazris, a partner at Hogan Lovells. That program will further the company’s efforts toward building a more inclusive work environment, and Leung says the ultimate result will not only be a more diverse workforce but a more diverse leadership team. She says more women have assumed leadership roles at the company already, but there is always more work to do to keep all employees engaged as Bristol-Myers Squibb, like so many companies these days, becomes an increasingly “flat” organization. Although she notes that managers cannot be mind readers when it comes to the kind of career path any given employee seeks, Leung says the onus is on managers to make sure everyone on the team is committed to their work. If that means letting go of someone to make room for another person who would better fit the company’s needs, it’s a move that has to be made. With the right people in place and a diverse set of voices to consider, the sky is the limit for Bristol-Myers Squibb. It’s that kind of endless opportunity that Leung says not only makes the company better but also keeps her optimistic on her way to the office every morning. Bristol-Myers Squibb partner Kirkland & Ellis LLP (www.kirkland.com) is a 2,200-attorney law firm representing global clients in M&A, private equity, and other complex corporate transactions as well as restructuring, litigation and dispute resolution/arbitration, and intellectual property matters. The firm has fourteen offices around the world: Beijing, Boston, Chicago, Dallas, Hong Kong, Houston, London, Los Angeles, Munich, New York, Palo Alto, San Francisco, Shanghai, and Washington, DC. As a leading adviser to some of the world’s largest public and private companies on their most complex, high-profile mergers and acquisitions, Kirkland’s M&A practice is consistently recognized for innovation, creativity, energy, and, above all, a profound commitment to quality. The firm coordinates globally to bring together best-in-class lawyers across an extensive, cross-border platform that includes renowned tax, finance, antitrust, litigation, intellectual property, regulatory, and executive compensation lawyers (as well as attorneys that focus on related practices areas such as FCPA, environmental, and real estate). The firm’s M&A attorneys guide clients to smooth resolutions across a broad spectrum of industries and complexities, including representing companies and boards of directors under attack by activists and in connection with contested transactions. The firm prides itself on having lawyers—across all practice areas that are essential to sophisticated mergers and acquisitions—work together as an integrated, multidisciplinary team to provide seamless service with a focus on practical, commonsense problem solving. At Hogan Lovells, diversity and inclusion is at the core of who we are and how we do business. We are a high-performing global team with people from different backgrounds, perspectives, and life experiences. We are at our best when we can be ourselves—working together and delivering for our clients. Our Global Diversity and Inclusion Committee and ten regional diversity teams throughout the world are embracing fundamental change by embedding diversity and inclusion into everything we do. We have conducted mandatory unconscious bias training, and our global agile working policy provides flexibility for working parents and caregivers. We’re widening access to the legal profession for ethnically diverse, traditionally underrepresented, and LGBT students through youth-engagement programs. And, our network and affinity groups give those who are traditionally underrepresented in the legal profession a chance to build relationships that will help them grow professionally. We embrace inclusivity, educate on differences, and celebrate the unique value of each of our people. 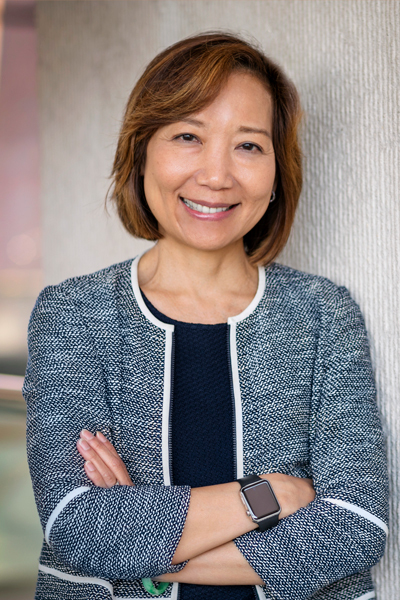 We applaud Sandra Leung and Bristol-Myers Squibb for their dedication and commitment to improving diversity at their company, and we hope to work together on these efforts in the future.